Well, yesterday was all about the girls (and a little about myself, but I'm allowed--I'm a girl). Audrie went to school, so I decided to browse a few garage sales (didn't find anything) and then went home for a little stamping time. After I picked Audrie up, we went and took lunch to Lindsie up at her school and ate with her (Chic-fil-A as requested). Went home for some more stamping time and a movie for Audrie. After school let out, two of Lindsie's friends came over to practice their dance routine for the school talent show coming up (so cute!). I made White Chicken Chili for dinner, another of the girls' favorites. Then around seven, I dropped them off at a local gymnastics center for "open gym" night (which they love), went to Sonic and got a blended float for myself and came home for a little more stamping time and made this card for today's Sketch For You To Try from Jen, thinking about my very enjoyable day with my girls (and stamping). I love the idea of this sentiment with ladybug stamps (get it? GIRLS--LADYbugs! ), so I used it, even though it's a little large for the delicate bugs. I already had all this fun Girl Friday paper (Cosmo Cricket) out on my desk from another project that ya'll will see real soon, so because of the name of it, I went with it for a scrappy feel to this card. Anyway, the fun didn't stop after the girls got home at 10. They went to bed and Lindsie started feeling sick and actually threw up all night and is still pukey this morning. It will be a good day for a "girls' day in" today and just take care of her. Girls Rule even when the mom has to hold hair back and wipe back tears when their little ladybugs are not feeling well. SUSIE Q-TIP: I love my Cat's Eye inks. They are perfect for inking edges for a scrappy look, as the "pad" is very spongey. I recommend when using a brand new, never before opened, really inky and juicy ink pad to sponge edges (especially black), you should let the sponged pieces dry thoroughly before messing with them. This way, ink won't get where you don't want it. BLACK INK. Don't ask me how I know this. I don't want to talk about it. This is so cute! I am in love with those bugs! What a great design! Sounds like you have been having fun! This is so fun and cheerful! Thanks for always making me laugh when I read your posts! What a fun card...love the colors and DP you used! This is just too darn cute and FUN! Love that sentiment and your story about girls' day yesterday. Hope your daughter is feeling all better today! This is a gorgeous card! So girly. I love it! Adorable, Susan! Love the ladybugs and the Girl Friday papers. Hope your little one is feeling better soon! WHAT A CUTE CARD to celebrate all three of you girls!! Hope Lindsie is feeling better. I really enjoy all the stories you have to tell on your posts. It makes me feel even closer to you! You are a delight! Your cards are darling. I just signed up to be a follower of your blog! (feel free to stalk mine as well-it's not as cute, but I'm working on it!) I love colorful cards, and you made me smile with all of your colors!!! Great job! 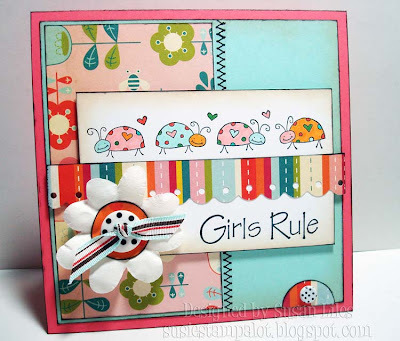 Those cute ladybugs are just so perfect with those colors and those papers! Beautiful card!! the colors are so fun together!